of Italy, with only 33 residents, according to the latest census of 2001, although the exact number of them always varies slightly. Discover here this unique village and its patron saint. According to the according to the Catholic church, saint Mary the mother of Jesus at her death was taken to the heaven body and soul, and this is called the assumption of Mary (in Italian is assunzione di Maria or Maria assunta). Although this was established as a dogma, that is a statement deriving from a revelation by God only in 1950 by Pope Pius VII, the tradition dates back to the early times of Christianity the assumption of Mary is celebrated in many places and has inspired countless artworks. The feast of the patron saint of Morterone is celebrated every year on the 15th of August. The traditional celebration is an occasion when the of the original residents come back to their village and it also attracts tourists. The celebration starts at 10,00 with the holy mass in the local church. At the end, statue of the virgin is taken in procession by the "portatori" (bearers) along the traditional route, accompanied by prayers, song dedicated to Mary and by the music of the band. In the afternoon at 4.00, There is the incanto dei canestri, which is the sale at auction of baskets containing gastronomical specialities presented to the church. Morterone is a comune in the Lombardy, in province of Lecco. It is on a mountain, its altitude is 1070 metres above the sea level and has about 33 inhabitants. It is located at the feet of mount Resegone and it is the ideal place for those who love the mountains and peacefulness, being in a very isolated place. The comune is composed of various hamlets and it seems that there was a community there since 1100. In 1363 the present church was dedicated to the assumption of Mary. In the past the village was honoured of the visit of Saint Caro Borromeo in 1582 and that of Federico Borromeo at the beginning of '600. At the time in the village there where 320 inhabitants. 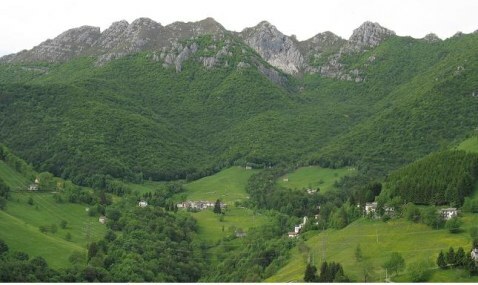 In '800, with the development of industry in the Lecco area, the village produced and supplied charcoal but in '900 it began to become depopulated, with two thirds of the over 400 inhabitants (called bergamini) living there only in summer to graze milk cows. As you can see from the picture (click on it to view it larger), the beauty of the place is in its mountain landscape, win many woods (even represented by the tree in its coat of arms) offering the opportunity, in summer, to take wonderful walks up the mountain, on foot, riding a horse or a mountain bike or just relax and breathe clean mountain air, detach oneself from everyday's frenetic rhythms. Along the footpaths in the woods, you can see the old way to Morterone, an ancient limekiln, a charcoal pit and a monumental beech. In the past, cattle-breeding was very important for people living in the mountain and in this area woods were reduced to create grazing land. Still today, in summer herds are taken up the mountain to graze then you can easily come across cows in the pastures and in the alpeggi, small shelters for animals and people, where they also produce cheeses that you can buy. They are small productions but of very good quality. In winter, snow falls abundantly and offers a completely different but equally fascinating sight. On the last Sunday of February they organise a winter rally for anyone practices ski touring and excursions. Equipped with snowshoes (ciaspole) or skis, participants can start from 8.00 in the morning from wherever they prefer. The important thing is to get to the top of mount Resegone by midday to receive a ticket that entitles you to collect a souvenir T-shirt. Once descended, it's possible to go and eat polenta taragna (made with corn flour and cheese). It sounds a good fun! Also they give prizes to the biggest group, the most elderly and youngest participants and those come from furthest. In the the local restaurant (trattoria) there is always some sort of entertainment. Another interesting characteristic of the comune area is the presence of a Karstic area, that is places where water, by running, has formed galleries, caves and underground rivers. The interest for and the study of this phenomenon developed from the '80s and so far forty caves have been explored and 10 chilometres of galleries traced. For the bravest ones, it's possible to practice canyoning (torrentismo), which is the descent of a mountain stream on foot (in the water), adequately trained and equipped (see addresses in the brochure). In Morterone you can stay in one bed & breakfast or, if there is no space, you can stay at Lecco and go to the village for a trip. Use this form to search. Don't miss the opportunity to visit Morterone at any time of the year!